Tradition associates Chongqing with the State of Ba which is only in myth without any solid proof that Ba actually existed.The Ba people supposedly established Chongqing during the Spring and Autumn period after moving from their capital Yicheng (夷城) in Hubei under pressure from Chu. This new capital was first named Jiangzhou (江州). During the Second Sino-Japanese War (1937–1945), it was Generalissimo Chiang Kai-shek's provisional capital. After Britain, the United States, and other Allies entered the war in Asia in December 1941, one of the Allies' deputy commanders of operations in South East Asia (South East Asia Command SEAC), Joseph Stilwell, was based in the city. The city was also visited by Lord Louis Mountbatten, the Supreme Commander of SEAC which was itself headquartered in Ceylon, modern day Sri Lanka. Chiang Kai Shek as Supreme Commander in China worked closely with Stilwell. The Japanese Air Force heavily bombed it. Due to its mountainous environment, many people were saved from the bombing. Due to the bravery, contributions and sacrifices made by the local people during World War II, Chongqing became known as the City of Heroes. Many factories and universities were relocated from eastern China to Chongqing during the war, transforming this city from inland port to a heavily industrialized city. In late November 1949 the Nationalist KMT government fled the city. 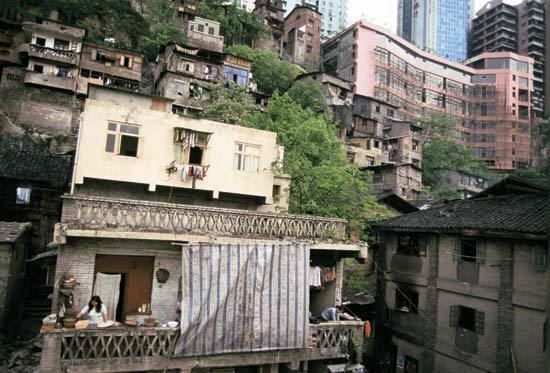 In the first decade of the 21st century, the city became notorious for organised crime and corruption and it is still the most dangerous city in China. Gangsters oversaw businesses involving billions of yuan and the corruption reached into the law-enforcement and justice systems. In 2009, city authorities under the auspices of municipal Communist Party secretary Bo Xilai undertook a large-scale crackdown, arresting 4,893 suspected gangsters, "outlaws" and corrupt cadres, leading to optimism that the period of gangsterism was over. However, local media later highlighted the apparent reliance by the authorities on torture to extract confessions upon which convictions were based. In December 2009, one defence lawyer was controversially arrested and sentenced to 18 months in prison for "coaching his client to make false claims of torture" and in July 2010, another lawyer released videotapes of his client describing the torture in detail. In 2014, four policemen involved in the interrogation were charged with the practice of "opposed illegal interrogation techniques", considered by observers to be torture. The number of security cameras increased significantly in the early 2010s to the highest of any city in the world at around 500,000. 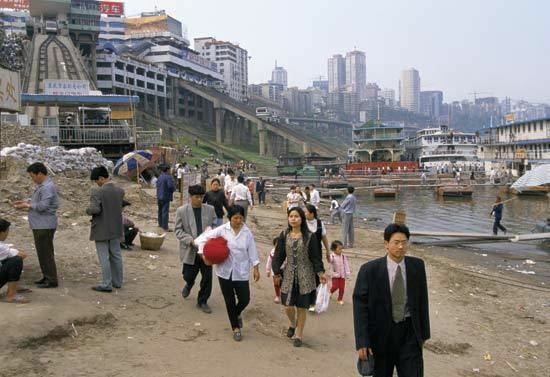 Chongqing covers a large area crisscrossed by rivers and mountains. The Daba Mountains stand in the north, the Wu Mountains in the east, the Wuling Mountains in the southeast, and the Dalou Mountains in the south. The whole area slopes down from north and south towards the Yangtze River valley, with sharp rises and falls. The area is featured by mountain and hills, with large sloping areas at different heights. Typical karst landscape is common in this area, and stone forests, numerous collections of peaks, limestone caves and valleys can be found in many places. The Yangtze River runs through the whole area from west to east, covering a course of 665 km (413 mi), cutting through the Wu Mountains at three places and forming the well-known Three Gorges: the Qutang, the Wuxia and the Xiling gorges. Coming from northwest and running through "the Jialing Lesser Three Gorges" of Libi, Wentang and Guanyin, the Jialing River joins the Yangtze in Chongqing. Chongqing has a monsoon-influenced humid subtropical climate (Köppen Cwa/Cfa) similar to Shanghai, and for most of the year experiences very wet conditions. Known as one of the "Three Furnaces" of the Yangtze River, along with Wuhan and Nanjing, its summers are long and among the hottest in China, with highs of 33 to 34 °C (91 to 93 °F) in July and August in the urban area. Winters are short and somewhat mild, but damp and overcast. The city's location in the Sichuan Basin causes it to have one of the lowest annual sunshine totals nationally, at only 1,055 hours, lower than much of Northern Europe; the monthly percent possible sunshine in the city proper ranges from a mere 8% in December and January to 48% in August. Extremes since 1951 have ranged from −1.8 °C (29 °F) on 15 December 1975 (unofficial record of −2.5 °C (27 °F) was set on 8 February 1943) to 43.0 °C (109 °F) on 15 August 2006 (unofficial record of 44.0 °C (111 °F) was set on 8 and 9 August 1933). As one of the most polluted cities in China, Chongqing, with over 100 days of fog per year, is also known as the "Fog City" (雾都), and a thick layer of fog shrouds it for 68 days per year during the spring and autumn. "There is an old saying in China, probably two thousand years old, that 'a Szechuen dog barks at a sun,' because the sun so seldom appears," During the Second Sino-Japanese War, this special weather possibly played a role in protecting the city from being overrun by the Imperial Japanese Army. Chongqing is the largest of the four direct-controlled municipalities of the People's Republic of China. 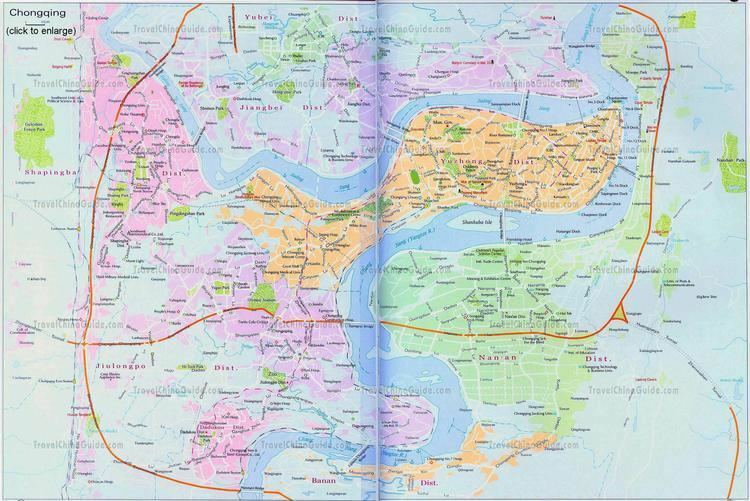 The municipality is divided into 38 subdivisions (3 were abolished in 1997, and Wansheng and Shuangqiao districts were abolished in October 2011), consisting of 26 districts, 8 counties, and 4 autonomous counties. The boundaries of Chongqing municipality reach much farther into the city's hinterland than the boundaries of the other three provincial level municipalities (Beijing, Shanghai and Tianjin), and much of its administrative area, which spans over 80,000 square kilometres (30,900 sq mi), is rural. Chongqing is the only Chinese city that keeps public aerial tramways. Historically there were three aerial tramways in Chongqing: the Yangtze River Tramway, the Jialing River Tramway and the South Mountain Tramway. Currently, only Yangtze River Tramway is still operating. This tramway is 1,160 metres (3,810 feet) long, connecting the southern and northern banks of Yangtze River. The daily passenger volume is about 10,000. Chongqing is one of the most important inland ports in China. There are numerous luxury cruise ships that terminate at Chongqing, cruising downstream along the Yangtze River to Yichang, Wuhan, Nanjing or even Shanghai. In the recent past, this provided virtually the only transportation option along the river. However, improved rail, expressways and air travel have seen this ferry traffic reduce or been cancelled altogether, thus most of the river ferry traffic consists of mostly leisure cruises for tourists rather than local needs. Improved access by larger cargo vessels has been made due to the construction of the Three Gorges Dam. This allows bulk transport of goods along the Yangtze River. Coal, raw minerals and containerized goods provide the majority of traffic plying this section of the river. Several port handling facilities exists throughout the city, including many impromptu river bank sites. Chongqing North Railway Station is a station handling many long-distance services and high-speed rail services to Chengdu, Beijing and other cities. It was completed in 2006 and is connected to Metro Line 3. Currently, Jiangbei airport has two terminals: Terminal 1 (old original terminal) serving international flights; Terminal 2, larger building split into Halls A and B serving domestic flights. The first, second and third phase of the airport came into operation in January 1990, December 2004, and December 2010 respectively. The domestic terminal is capable of handling 30 million passengers while its international terminal is able to handle more than 1 million passengers annually. A third terminal that will more than double capacity of the airport is currently under construction along with a third runway, which are set to open in Spring 2018. A fourth terminal and runway are planned to start construction in 2019. Ppublic transport in Chongqing consist of metro, intercity railway, a ubiquitous bus system and the world's largest monorail network. According to the Chongqing Municipal Government's ambitious plan in May 2007, Chongqing is investing 150 billion RMB over 13 years to finish a system that combines underground metro lines with heavy monorail (erroneously called 'light rail' in China). As of 2017, four metro lines, the 14 km (8.7 mi) long CRT Line 1, a conventional subway, and the 19 km (12 mi) long heavy monorail CRT Line 2 (through Phase II), Line 3, a heavy monorail connects the airport and the southern part of downtown., Line 6, runs between Beibei, a commuter city in the far north to the centre. Line 5 is due to open late 2017. See: Twelve Views of Bayu As the provisional Capital of China for almost ten years (1937 to 1945), the city was also known as one of the three headquarters of the Allies during World War II, as well as being a strategic center of many other wars throughout China's history. Chongqing has many historic war-time buildings or sites, some of which have since been destroyed. 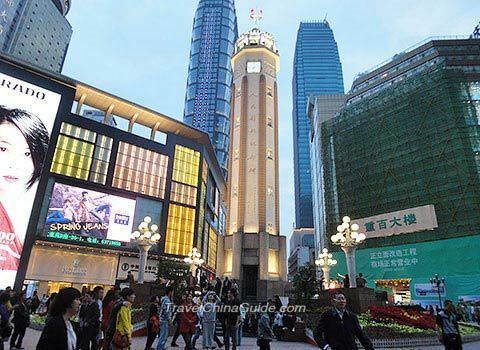 These sites include the People's Liberation Monument, located in the center of Chongqing city. It used to be the highest building in the area, but is now surrounded and dwarfed by numerous shopping centres. Originally named the Monument for the Victory over Axis Armies, it is the only building in China for that purpose. Today, the monument serves as a symbol for the city. The General Joseph W. Stilwell Museum, dedicated to General "Vinegar Joe" Stilwell, a World War II general, the air force cemetery in the Nanshan area, in memory of those air force personnel killed during the Second Sino-Japanese War (1937–1945), and the Red Rock Village Museum, a diplomatic site for the Communist Party in Chongqing led by Zhou Enlai during World War II, and Guiyuan, Cassia Garden, where Mao Zedong signed the "Double 10 (10 October) Peace Agreement" with the Kuomintang in 1945]. The Jinfo Mountain (Golden Buddha Mountain). 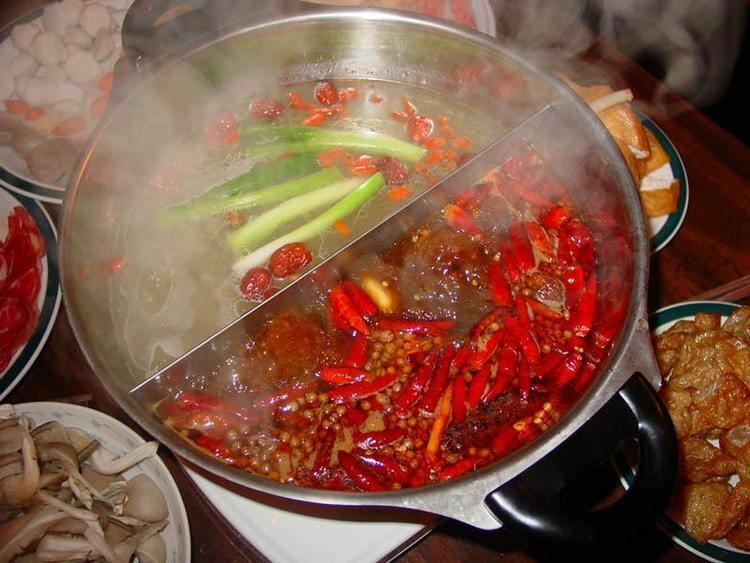 Hot pot – Chongqing's local culinary specialty which was originally from the Northern China. Tables in hot pot restaurants usually have a central vat, or pot, where food ordered by the customers is boiled in a spicy broth. As well as beef, pork, lotus and other vegetables, items such as pig's kidney, brain, duck's bowels and cow's stomach are often consumed.